A powerful collection of well written Americana songs, clever lyrics and world class production values thanks to award winning producer John Jacob. 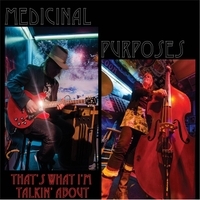 Medicinal Purposes is an Americana duo from the Midwest that has incorporated influences as diverse as Johnny and June, Steve Earle, Gillian Welch, Joni Mitchell, John Prine and Eric Clapton; just to name a few. Their songs are, by turns amusing, tender, hopeful, positive, heartfelt and beautiful. The arrangements and guest artists are world class and the production is stellar, thanks to award winning producer John Jacob.